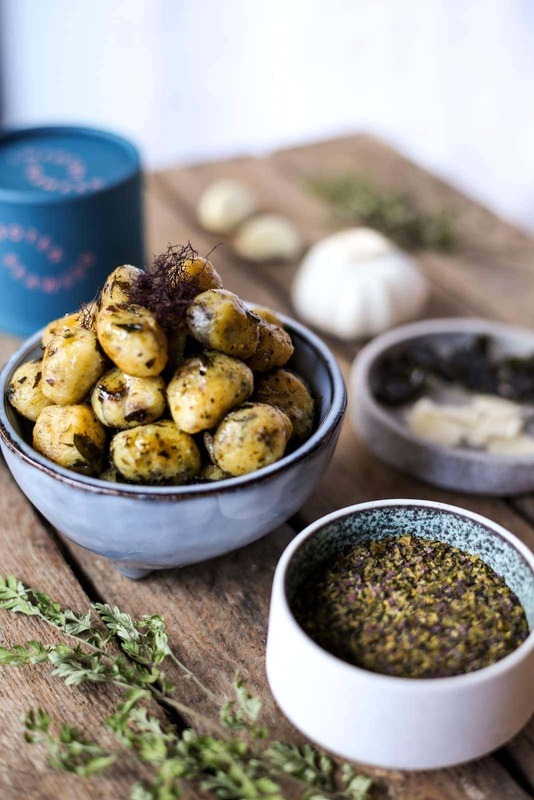 Pan Roasted Seaweed Gnocchi - Lofoten Seaweed | From Lofoten, Weed Love. 1. Place a large pot on the stove and bring to a boil. Once the water is boiling add the potatoes and cover with a lid. Leave boiling for 20 minutes. 2. Take a potato from the pot, hold in a tea towel and squeeze to test how soft it is. When you can easily make a dent in the potato it is ready. Remove the potatoes from the water. It is better for them to be overdone then under done. 3. Peel the potatoes one by one and place them in a large flat dish. You can use a potato press or fork to mash the potatoes until there are no lumps left. 5. Put a large pot on the stove to boil. 7. When the water is boiling place a handful of gnocchi in the water at a time. Make sure you don’t put too much, the gnocchi should not touch in the water. When the gnocchi begins to float they are ready to take out, this should take 30 seconds to a minute. Place the finished gnocchi in a bowl. 8. Repeat with all of the gnocchi. 2. Take a frying pan and heat the butter until melted. Add the onion and cook until golden, then add garlic. 3. Make sure the pan is hot enough by dropping one piece of dry winged kelp in first. If it bubbles at the edges and changes colour it is hot enough. Add the rest of the dry winged kelp to the pan. 4. When the winged kelp has turned a golden brown colour add your gnocchi to the pan and bring the heat down to medium. Fry the gnocchi in the pan until they become brown and slightly crispy.